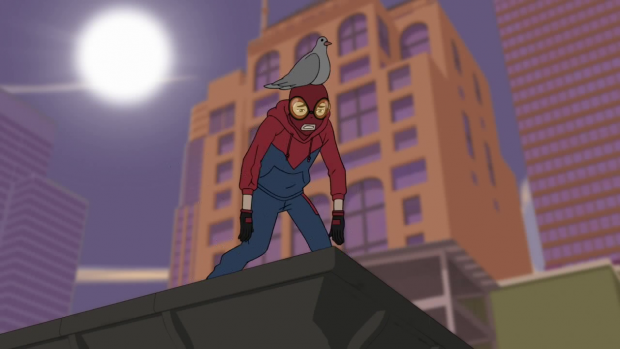 Spider-Man once again receives the animated TV treatment in Marvel’s Spider-Man; a show that takes Peter Parker (Robbie Daymond) back to the earliest days of his superhero career. The series premiered with back to back episodes so I’ll take my usual approach of reviewing them one at a time and not watching the second before I’ve finished reviewing the first. I find that it’s best to be unburdened by future knowledge. Even though we’re right back at the beginning of Peter’s career as Spider-Man we aren’t shown the origin story in the first episode. If you’re so inclined then Disney released a series of shorts chronicling this version of the origin story. I didn’t see fit to review it because it’s the same story that has been told too many times though the application of the scientific method as an approach to Peter learning about his powers was a nice touch and there are some details about this version of Peter Parker’s world in there too. All told it isn’t different enough to warrant deeper analysis so there isn’t much more for me to say about it. “Horizon High Part 1” begins two weeks after Peter gets his powers and he’s definitely still learning how to use them effectively. 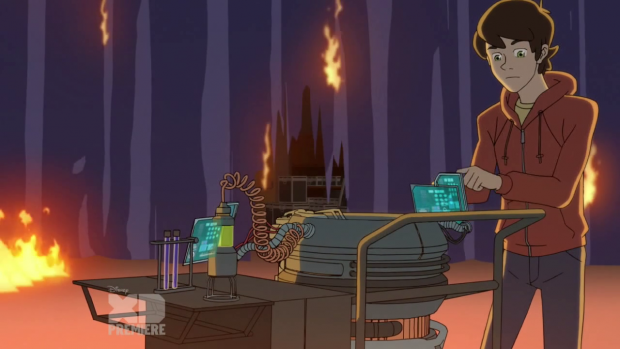 The costume he’s wearing is very rudimentary and a running thread -pun possibly intended- through the episode is changing the settings on his web shooters so that they actually work. Having seen so many “early days of Spider-Man” stories in various mediums I found none of this to be hugely original but the presentation of it wasn’t bad at all. I really like the scientific approach Peter takes to problem solving as it brings a very important part of his character to the fore and uses that to define him. This show seems to lean less into the teenage problems that Peter faces and focus more on the impact his powers have on him. Certainly in this episode he spends a lot of time making observations and using them to dictate his actions. 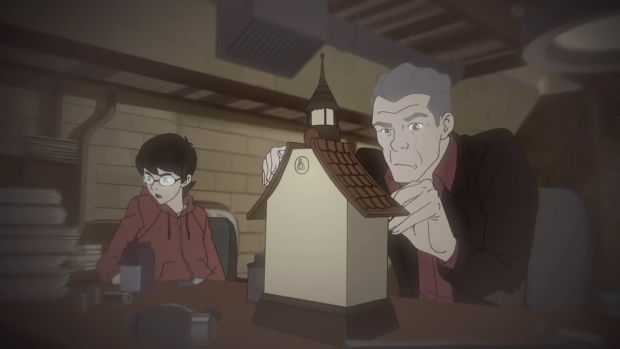 One thing the episode does that differs from previous iterations is making Uncle Ben (Patton Oswalt) a big part of the story. As with any Spider-Man story Uncle Ben is dead but his lessons linger and this episode uses flashbacks to solidify the importance of him in Peter’s life. The flashback itself is interesting because it takes a particular issue that Peter Parker often has when it comes to relating to others. In this case he doesn’t want to tutor Flash Thompson because of the frequent bullying but Uncle Ben casually leads him to the conclusion that he should be the better man. This I really liked as it established that Peter is doing much more than learning the lesson as coming to the conclusion himself allows him to truly understand it. Uncle Ben aims to get him to realise the meaning of the words rather than have it be a doctrine that Peter is slavish too. Having it presented as an equation is an obvious yet satisfying way to tie it into the overall scientific theme that appears to define this series. Scientific pursuits are at the root of everything in this episode. The main plot involves Peter’s desire to be enrolled in Horizon High; a high school devoted to nurturing talented young geniuses. His best friend, Harry Osborn (Max Mittelman) has already secured a place but Peter hasn’t managed to make the cut for whatever reason. He laments a lack of funds to afford attending the school as well but that’s a separate issue when he hasn’t even been offered a place. Thankfully a well timed demonstration that goes horribly wrong is the perfect chance for Peter to prove himself. Notably he solves the problem as Peter Parker not Spider-Man which earns him the attention of Max Modell (Fred Tatasciore) who is immediately impressed with Peter’s practical scientific ability. This secures him an offer though also gets Harry Osborn suspended pending an investigation since evidence points to him. It’s the classic Peter Parker problem of something good in his life being counterbalanced by something bad. It’s great for him that he has a chance to pursue his scientific dreams but also bad that his best friend may be disadvantaged by his good fortune. For the moment there is no animosity between the two friends but I suspect this will change as the season progresses. There’s a lot to unpack from the Horizon High idea. It’s an interesting spin on Peter Parker’s career at Horizon Labs in fairly recent comic books. in the comics Horizon granted him access to greater resources, easier excuses to apply to his long absences and the overall sense that the character is moving forward. Horizon High seems to have similar potential except it allows Peter to achieve this much earlier in his life. The only drawback is that it possibly makes things a little too easy for him since his academic life could so easily feed into his superhero life. Time will tell on that one but I fear that the social outcast deemed unreliable by his peers aspect of the character could be cast aside which could mean that the series loses something important. As I said, time will tell. The characterisation of Max Modell is well handled. He comes across as a fair minded, patient and compassionate man. I got the impression that he sees a lot of himself in Peter Parker which makes sense considering he will clearly embody the mentor role from here on out. It’s really striking that he doesn’t hurl accusations at Harry when evidence appears to point his way which ties into his occupation as a scientist who won’t reach a conclusion without fully considering the facts after careful research. Considering he has a fairly small role in the episode he is pretty well defined so far. Peter’s characterisation is similarly well done. Robbie Daymond injects the right amount of youthful charm and excitement to the role while also hinting at a lot of pain beneath the surface. The Uncle Ben flashbacks suggest that he is haunted by the memory of his Uncle and still carries that guilt with him. This doesn’t translate into needless angst as he still has a lot of fun as Spider-Man. The responsibility weighs heavily on him but he’s still positive and optimistic. So far the right balance is being struck between these aspects of the character so I hope this continues. The episode doesn’t fare so well on the villain front. Just like the recent Spider-Man: Homecoming Peter Parker faces down the Vulture (Alastair Duncan) and there’s very little of note about the character. He is someone who feels wronged by Max Modell though there is mention of the Vulture having stolen equipment from Max which puts him firmly on the wrong side of the law and removes any opportunity for the character to be in any way nuanced. The episode doesn’t pretend there’s anything more to the character than a simple means to an end but the way the defeat is handled is more than a little underwhelming. There’s also something strangely over the top about the character that reminds me of my limited experience with Anime but that doesn’t count against the Vulture since he more or less matches the tone of the rest of the episode and any issue I have with it is purely personal. 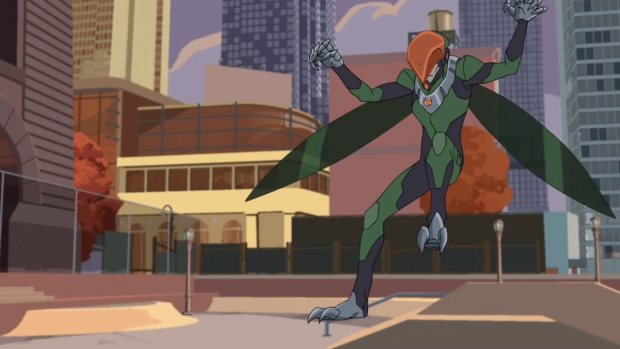 As a side note, the excellent Spectacular Spider-Man also started with a newly powered Peter Parker taking on the Vulture. The handling of the character there wasn’t much better than it was here and this comment was largely so that I could recommend the recent podcast where we talked about that series. Lastly I’ll comment on the animation style as it’s probably not something I’ll return to very often. For me it’s something I’ll have to get used to but I said the same about Spectacular Spider-Man. It’s a good looking series but the design work isn’t to my personal taste though I do think it will grow on me. The rudimentary Spider-Man costume looks good and it stands out against the comparatively drab backgrounds but the character designs seem somewhat washed out and expressionless at least for now. Everyone is distinctive but not very well visually defined. There is certainly opportunity for the action to be dynamic and there are some standout examples in this episode. The main highlight for me was the depiction of Peter’s spider sense where he was presented with the scenario with everything he needed to bear in mind highlighted all while his perception of time had slowed down. Removing most of the colour at this point was a nice touch and really brought across how Peter sees the world. Nothing else was all that noteworthy at least from the point of view of this episode. I like this so far. Nothing about it stands out for being original but there is an attempt to take what is familiar and present it in a slightly different way. The scientific approach works well as it highlights a particular aspect of the Peter Parker character and approaches his powers in a slightly different way to what has been previously seen. This feeds into his character and how he approaches problems as well as contributes to the underlying theme of the episode -and possibly the series-. Establishing Max Modell as a mentor figure while having flashbacks of Uncle Ben help Peter moralise is a nice touch and allows a different level of insight into Peter’s character. The episode suffers when it comes to the villain. I fount the Vulture to be underwhelming as no attempt was made to establish him as anything more than a means to an end as far as the episode goes. There was also something off about the way he was portrayed that may count as a personal issue rather than a problem the episode has as such. The animation style will take some getting used to but that’s also a personal problem. I find that the costumes and colours are nicely done but the character designs are oddly vacant and lack expression. It’s something I may get used to as time goes on.